Our infinity cove is professionally built and very well maintained. The Infinity cove is situated within our main ground floor hire studio, the rear wall of the cove is 7.5 metres, it has a return wall at 6m and the height of the cove is 5m. 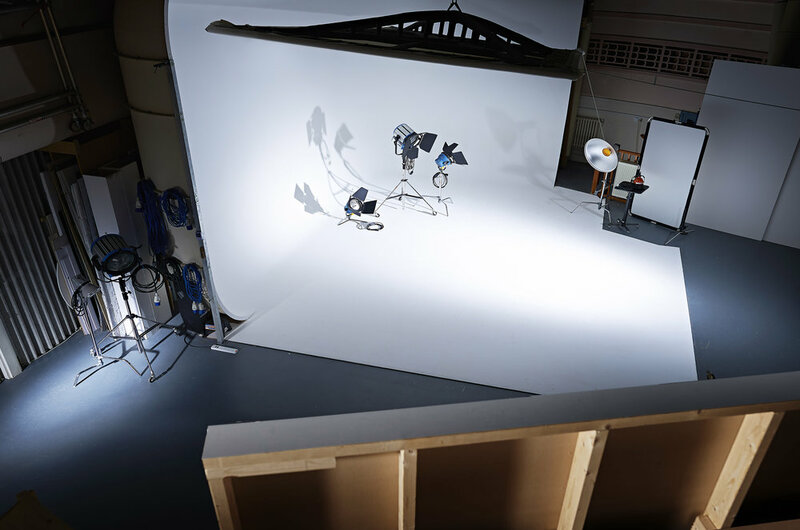 There is plenty of space all around for lighting and 7 meters of clear space in front for the camera to be positioned away from the subject (measured from centre of the cove to rear studio wall). We have vehicle access to the cove directly from the street through a 3.5m wide by 3.3m high. The Cove has a full size “floating ceiling” which can be lowered into the L shaped cove, light can be projected onto the floating white ceiling which gives a lovely smooth top illumination, if more control is needed the lighting can be “cut” this helps to give a graduated light effect on shiny products including vehicles! If a third “wall” to the cove is required we have a huge motorised screen which measures 6m x 4m light can be bounced off this frame to help with some subjects. For stills shoots we can provide bright well balanced daylight illumination or studio flash lighting using the latest high speed Elinchrom strobes, we have 2 sizes of Elinchrom Litemotiv Parabolic reflectors. We have a wealth of knowledge of lighting within our studios and would be completely happy to offer advice on the best solution for your shoot, if you prefer to provide your own lighting this is fine, we understand that some photographers feel comfortable with their own gear!